YBK Series feed through terminal blocks are tension clamp connection style and are DIN rail mounted. The tension clamp can easily be opened with a small screwdriver inserted next to the wire entry, then slip in the field wire and remove the screwdriver for a reliable and secure connection. 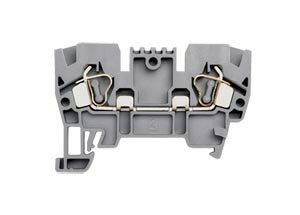 The YBK terminal blocks come in all wire ranges and no pre-treatment of the wire is necessary, even for stranded wire. A full line of accessories are available including end plates, end brackets, cross connectors and marking tags. The YBK series also includes 4 size grounding terminal blocks. 참고: Add “-R” for red and “-B” for blue colored terminal blocks, no additional charge.